1. 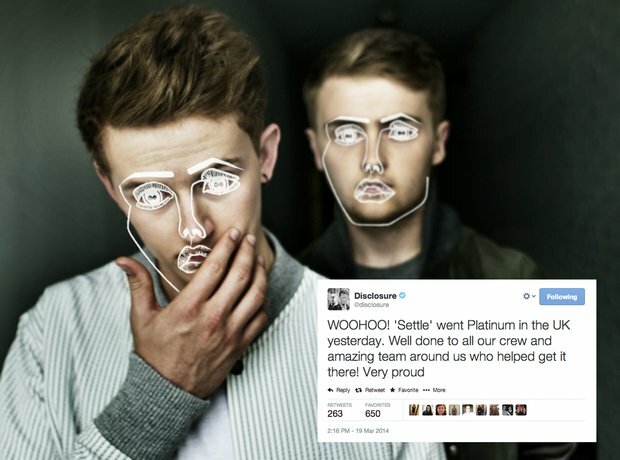 Congratulations to Disclosure whose debut album 'Settle' went platinum this week. "WOOHOO! 'Settle' went platinum in the UK yesterday. Well done to all our crew and amazing team around us that helped us get it there. Very proud." 2. We learnt on Twitter that Miguel has only two rules he lives by. 3. As if Sam Smith doesn't know the answer! "Yummm RT @Martin Garrix And more hamburgers." "Everybody is nobody... Until they are a somebody. Believe in urself 1st." 7. We know Jhene Aiko's new song 'My Afternoon Dream' feels and sounds good. 8. Couldn't have said it better ourselves Sneakbo. 9. How does Tinie Tempah like his eggs in the morning though? 10. Note: Nelly does not condone wearing jeggings to Church. "Somebody just said that have worn 'jeggings' to church...!! SMH..!!! LMAO!... What's next? A 'Twerking' for jesus contest?"